I've been participating in Waiting on Wednesday for over 5 years because Wednesday is my favorite day of the week! I love sharing and discovering new books. If you've been around my blog before, you may know that I don't read fantasy. But I made an exception and read Rebel of the Sands, and....... it was awesome! But, ugh, is this really 528 pages????? It's okay. Deep breath. I can do this. I love this cover- plan on binging this series this summer. It looks so good. I hope you get the chance to read this series, Angela. Thanks for stopping by! Hee hee! Nice! I'm actually going to start this one today! It's the UK style one so it's even longer for some reason! LOL! It's so long it should count as 2 books for my challenge!! I can't wait to see what you think of it, Jessica. Thanks for stopping by. Wednesday is not my favorite day of the week, but WoW is definitely my favorite weekly meme and I love finding new books and expanding my TBR :) I hope we both enjoy this book, though the length scares me too lol. Maybe I should say Wednesday is my favorite day of the week on my blog? LOL. I work at home so all days are a blur for me. But I definitely love interacting with other blogs on Wednesdays. Thanks for stopping by, Brittany. Here's hoping we both get through this book easily. I won't let the length deter me! I adored this book so much! I think I liked Rebel more, but this one did not disappoint at all. I need book three. o_o I hope you enjoy this book when you get the chance to read it! I'm so glad to hear you enjoyed this one, Alyssa. Only another year and you can read book 3!!!! Love this cover! I need to read book one still, but I'm definitely planning on reading this series. Thanks for stopping by! Oh, YES, YES, YES!!!!! I own both books now, so I can go from one directly to the other!! 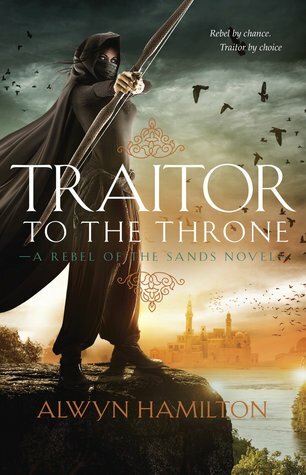 I don't have the hardcover of "Traitor To The Throne", though, but instead, the paperback edition. That was because I wanted the covers to match. The "Rebel of the Sands" hardcover has an abstract, very decorative cover design. The cover of the sequel is totally different -- it's a realistic illustration. I'm not that happy with it, either. So I got the paperback. I know....the books don't match anyway, because one is a hardcover, and the other a paperback. Oh, well! But at least the cover designs show some consistency. Lol. I can understand wanting the covers to match. I was surprised when I fist saw the hardcover. I hope you enjoy reading both books, Maria. Thanks for stopping by. This reminds me that I still need to read the first book in this series. I hope to get it read soon since I keep hearing so many amazing things about it. The first book is really good, if that's good enough incentive for you! Yo should definitely give it a try. Thanks for stopping by, Suzanne.